Book Your Wedding > Wedding Musicians > London > Ariella Strings "Guaranteed to make your ears smile!" All new wedding bookings! 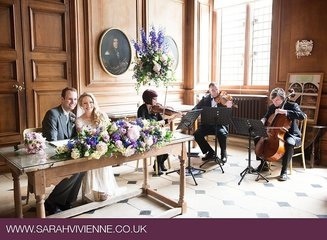 Exclusively for couples getting married at the venues who recommend us as their string group. Not valid with any other offer and subject to availability. Business Name: Ariella Strings "Guaranteed to make your ears smile!" Send an email to Ariella Strings "Guaranteed to make your ears smile!"